The Converse Blog: The Converse Blog: Dance with who brought you. What's up WKU? The Converse Blog: Dance with who brought you. What's up WKU? It’s quite simple really; you dance with who brought you. And for Western Kentucky, it was Converse that brought them to the dance, figuratively speaking, but they’ve spent the first two songs dancing with Nike. Now I don’t pretend to know the details or whose fault it really is. 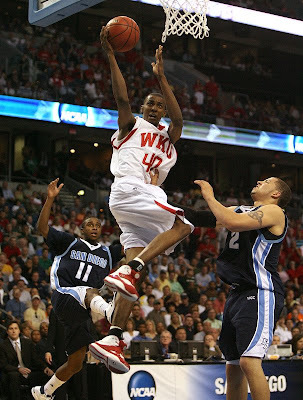 But what I do know is that with the exception of two players, Western Kentucky has worn Converse all season long. 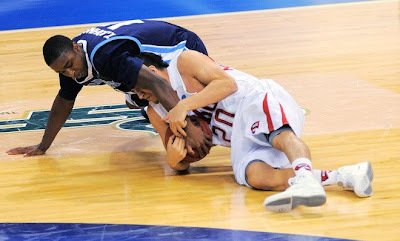 If you read this blog then you know I’ve been touting WKU as the other Converse school this season. Then when it comes to the tournament they dumb Converse for Nike. Okay, that isn’t completely true; four players from yesterday’s game still wore Converse. Two of them logged significant minutes with Jeremy Evans and Orlando Mendez-Valdez. Did Converse drop the ball and not get them some new shoes in time for the tournament? Did some of the players loose their shoes and Nike stepped in quickly with some Zoom BB 2’s? Did WKU just decide to change after wearing Converse the whole season? Whatever the reason, what should have been a really exciting run to the sweet sixteen for Converse has turned into one of the biggest question marks of the whole tournament. I’ve never seen a team switch brands of shoes from the regular season to the tournament. I emailed someone with the basketball team for some clarification, but I have not heard back from them. I am not trying to throw WKU under the bus here, I am just frusterated and decided to rant about it here. I am still rooting for them, there is no question about that. I sure would like to see them take the floor next game in some of the new Team Wade's that Marquette was wearing. Anyway, hopefully I can find out some more information between now and then. Below are pictures of Jeremy Evans followed by Orlando Mendez-Valdez wearing Converse from yesterday's game. Thanks for checking out the blog, if you have any information about this please let me know. Also thank you for voting in the poll, each poll has gotten more and more votes. Take some time and catch your breath after a wild weekend of hoops, because it starts all over again soon.